Joseph Dion was born on July 2, 1888 near Onion Lake, Saskatchewan, to Augustine and Marie Dion, members of the Kehiwin Indian band, whose reserve is near Bonnyville, Alberta (Mccardle 2008). He had two siblings Mary Therese and Toussant as well as four others who passed away from diphtheria. Dion was a descendant of Big Bear, a Plains Cree chief who is best known for refusing to sign Treaty 6 and for his involvement in conflicts associated with the North-West Rebellion (Pannekoek 2006). As a child, Dion attended day school on his reserve. This was only for a short while as the school was lost in a fire; he was then transferred to the Onion Lake residential school, a Roman Catholic institution. The children were given numbers to identify them: “They gave me number 7 as my brand, so I was one of the very first”, Dion wrote (Shattering the Silence). Dion clearly remembers the staff who worked at the school, reflecting that they were very hard workers and Brother Vermet, the priest in charge of the dormitory, was strict but never abusive. He has happy memories of his nine years spent at the school marred only by the persistence of illness and death among his classmates, primarily from tuberculosis. Dion graduated from the school at the age of 15 with a grade 8 education. He completed his grade nine by correspondence which qualified him to pursue teaching later on. Due to this religious education Dion became a devout Catholic which is reflected in his writing and later on in his religious work in his parish and other surrounding areas (Dion VI). Dion married Elizabeth Cunningham in 1912 and a few years later he opened the first school on the Kehiwin reserve where he taught for 24 years (Dion V). Dion and his wife lived on a farm by Long Lake where they raised their children. Elizabeth was often left alone while Dion travelled and she sold cream to finance his travels and yearly pilgrimages to Mount St. Joseph (scribd.com). In the 1930s Dion became concerned about the plight of the Métis people who had been displaced and lived in very poor conditions, and he sought to champion their cause. He was instrumental in forming the organization which would become the Metis Association of Alberta. 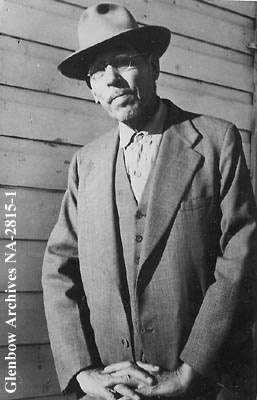 Dion supported the League of Indians of Western Canada as well and was part of the movement that formed the Indian Association of Alberta (Dion VI). He held key positions in both organizations for most of his life and often travelled between colonies and reserves attending meetings. Dion was mindful of presenting a positive image to the public in order to promote good relations and formed a Metis dance troupe in the 1930s in order to dispel any negative stereotypes about Indigenous people (Dion VI). Dion had always been exposed to the oral traditions of his people, his parents and other elders had told him stories of the Riel Resistance including the incident at Frog Lake and the Battle at Frenchman’s Butte. Dion’s interest in Cree and Métis history was given new life when he began to research traditional dances. He had already begun writing as early as 1912 “and some of [his] manuscripts [had] turned yellow with age” (Dion X). Dion observed that a lot had been written about “western Indians [by] white historians” and “these writers have been carried away with themselves and mixed fiction with truth” (Dion IX). He decided to write a book in the 1950s, tentatively titled “History of the Cree Indian in Western Canada”, and this was published in instalments in the Bonnyville Tribune. Dion worked on the manuscript periodically over the years but it was not completed at the time of his death, on December 21, 1960, at St. Louis Hospital in Bonnyville. After his death his widow arranged for all of his papers and writings to be placed in the Glenbow Museums archives. It was from these that his book My Tribe the Crees was compiled and published in 1979, edited by Hugh A. Dempsey (Dion VII). Although the book was edited to prevent repetition and put it into order it remains Dion’s words and style, a thorough description of the life, culture and “history seen through the eyes of the Indians, revealed at long last by the native people themselves” (Dion X). Barkwell, Lawrence. “Dion, Joseph Francis (b. 1888).” Scribd, www.scribd.com/document/35420958/Dion-Joseph-Francis-b-1888. Joseph Francis Dion Metis Association of Alberta, The Canadian Aboriginal Issues Database, sites.ualberta.ca/~walld/dion.html. “Joseph Frances Dion.” geni_family_tree, 8 Dec. 2017, www.geni.com/people/Joseph-Dion/6000000038706521297. “My Tribe, the Crees.” Faculty of Graduate Studies, Athabasca University, www.barbau.ca/content/my-tribe-crees. Pannekoek, Frits. “Mistahimaskwa (Big Bear).” The Canadian Encyclopedia, www.thecanadianencyclopedia.ca/en/article/big-bear/. McCardle, Bennett. “Joseph Francis Dion.” The Canadian Encyclopedia, www.thecanadianencyclopedia.ca/en/article/joseph-francis-dion/. Scanned documents/correspondence/photos of Joseph Dion: Joseph Francis Dion, http://www.glenbow.org/collections/search/findingAids/archhtm/dion.cfm.